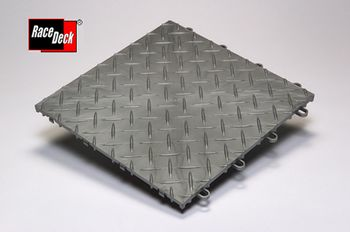 RaceDeck Flooring Systems are "Patented" multi-purpose floor systems that have been engineered to withstand the toughest mechanical environments. They are designed to keep you and your machine up and away from dirt, mud, debris, and flowing liquids - giving you a professional, clean work area. Great for garages, shops, trade shows, retail displays, car shows, or anywhere a high-tech floor is needed. 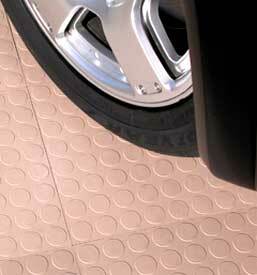 The #1 modular flooring system in Motor Sports. RaceDeck is great for a variety of uses! Call For Prices on Quantities of 480 or more. We will not be undersold!!! "...Simply drop dead beautiful...Difficult to express just how proud I am of this asset. Now I don't want to park my car or mower anywhere near it...it's just too nice! Thanks for the great product and great service..."
"In the interest of making my garage look better for entertaining and photo shoots, I checked with RaceDeck. The company makes a modular floor that is perfect for my needs; stylish, durable and stain proof! I did my whole garage over in an afternoon, including removing everything but the workbenches - the results are spectacular." 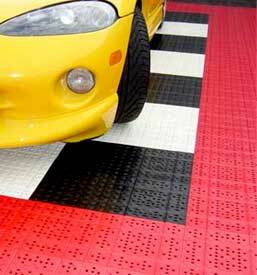 Be sure to take a look at our selection of Garage Floor Protection Mats for even more ways to protect your garage floor! NOTE: There is no 2nd-Day air available for this item! Aesthetically pleasing - Customize colors to enhance your vehicle! Click to view Diamond Colors & Info. Click to view Free-Flow Colors & Info. Click here to view the Quick & Easy Installation Guide!